It's probably too early to say this, but just thirty minutes of walking around Resorts World Sentosa was enough to make me not like it at all. Sans the upcoming Universal Studios theme park which might be a refreshing draw for families after all these years of aimless "shopping mall weekends", the "integrated" in Integrated Resort is really just a cover for expensive dining, luxurious shopping and high-roller gambling. I don't see any value-addedness to Singapore with a place like this, with its pretense grandeur and air of elitism that would cater best to wannabes and people desperate to flaunt their wealth, no matter how tiny or huge. It just feels so boring and completely uninspiring to me. 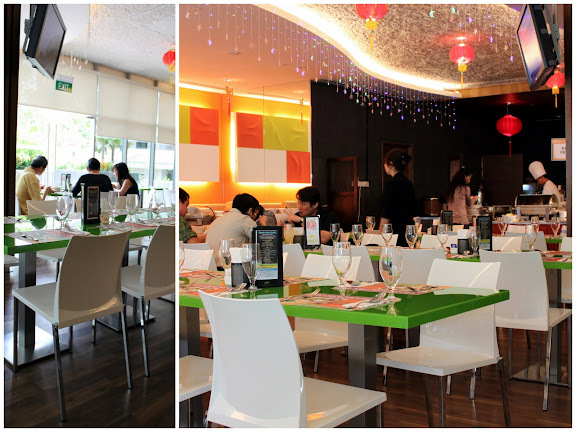 While still in its soft opening phase, there are at least five eateries that are currently open - Patio (Italian), The Dining Room (Chinese), Fiesta (breakfast and dinner buffet), Starz Restaurant (buffet) and Boulangerie (tea and cakes lounge). 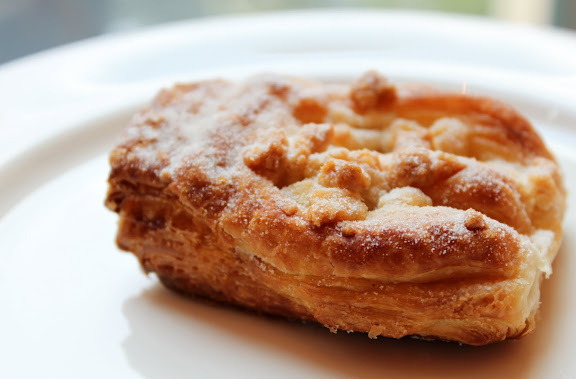 Boulangerie is very much a misnomer in itself because there's nothing much of a bakery here at Resorts World, with only six varieties of cakes, four choices of sandwiches and three selections of pastries (two danish, one croissant). I wish people would use their heads sometimes before jumping into French names and words. I've chosen not to give ratings for this post because they're all going to be sub-par anyway. 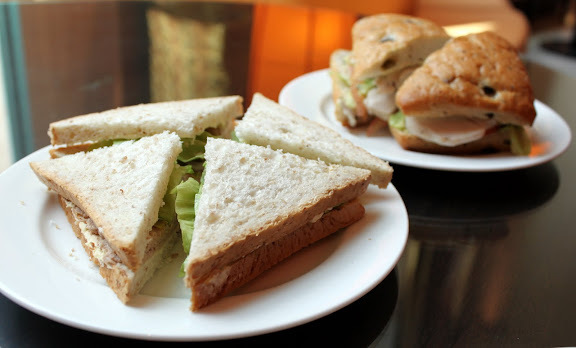 We were surprised that they need a chef to prepare sandwiches like these, with almost zilch effort in presentation as well. 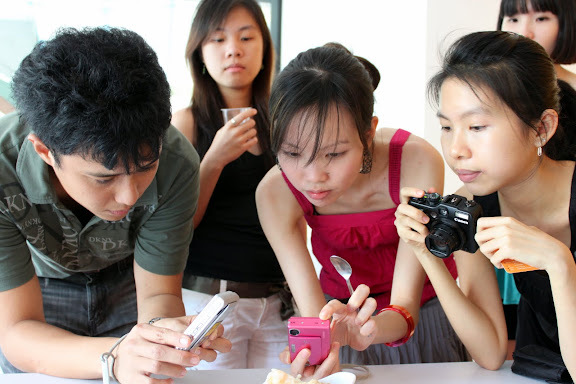 In Singapore, students around the age of thirteen (if not even younger!) are already taught sandwich preparation in "home economics" lessons. The Mayo Tuna Sandwich tasted as though it was out of a can while the chicken meat from the Roasted Chicken Foccacia was very bland. It's smaller than it looks, about a combination of two of those mini pastries from the Four Leaves bakery. Tastes just like it too. This was horrible, and for someone with simple and forgiving tastebuds like mine, I still couldn't go more than four forkfuls of this. The dark chocolate coating was overdone so much so that Tyler thought it had a dark soy sauce kind of aftertaste (!!!) while I felt the passionfruit crème brûlée inside was so sour and awful that it completely couldn't pair with the chocolate mousse. Perhaps the only thing that was passable for the afternoon, but it still couldn't impress. 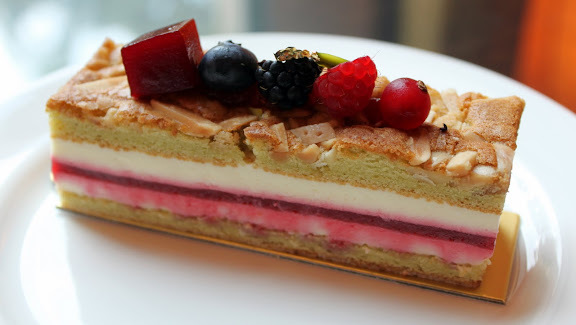 Cheesecake and jelly layer in the middle of dry pastry. It's difficult to go wrong with this, and true this could pass as well, but I've had so much better ones that this is just plain basic. 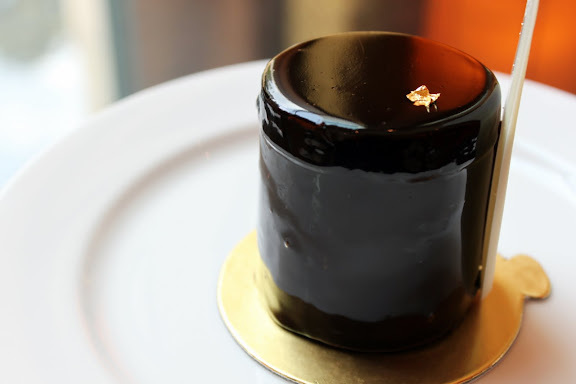 The chocolate was not as smooth as the one from Coffee Club (which has a caramel layer as well), and neither was it of a good quality as the chocolate from Laurent Bernard. Any saving grace? Well, the Chocolate Cookies Iced Latte was pretty good. That's about it. Boulangerie, Festive Hotel. 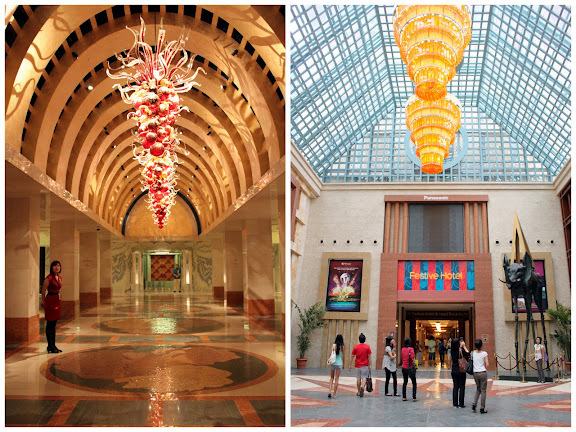 Resorts World Sentosa. 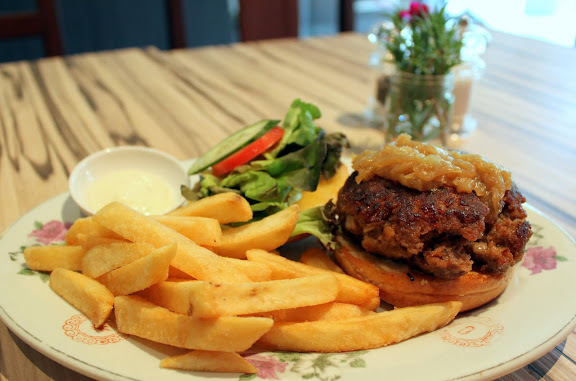 I've always wanted to try the brunch and burger from Epicurious at Robertson Quay, but the thought of travelling all the way there on a Sunday morning usually gets me back under the covers again. So you can imagine my delight when I came across its very first branch at The Rail Mall, and it's also good to know that it serves brunch on weekend mornings as well! As for now it may be a little difficult to spot Cafe Epicurious but look out for that crab claw signboard (belongs to a seafood restaurant Let's Clap) and it's pretty much along the same row of eateries. 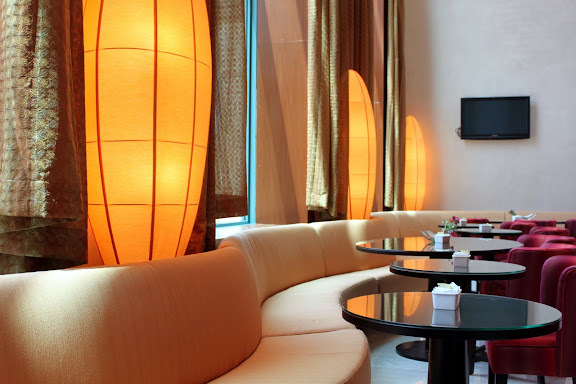 It was blazing hot outside at two in the afternoon and I of course took refuge in the cool indoors, but I can imagine how the tables and chairs decked out there would come around with their little space of serenity in the evening. 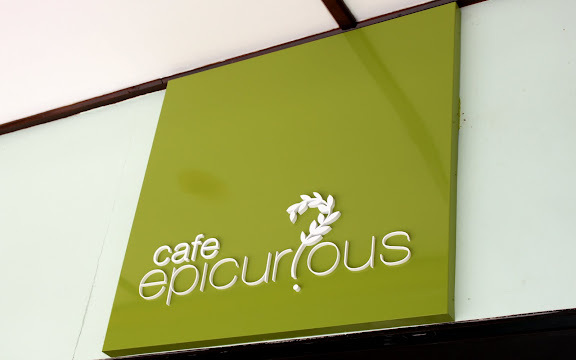 Cafe Epicurious also shares the space with its new joint venture partner Sweet Salty Spicy, a popular Thai eatery that I would definitely try someday. I ordered the set lunch that gave me a choice from two soups and four salads, but if you know me well enough I'd say no to greens almost immediately. 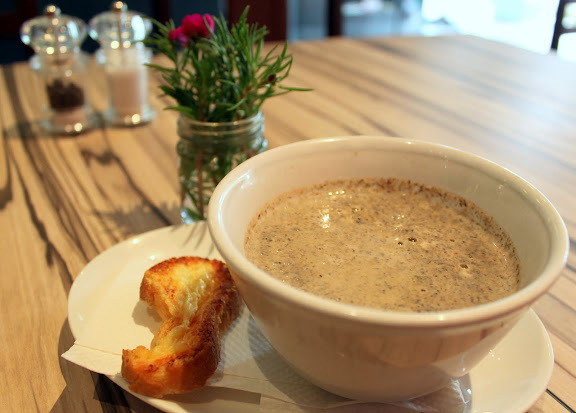 The mushroom soup however was very good and it certainly beats its more popular counterpart at The Soup Spoon. 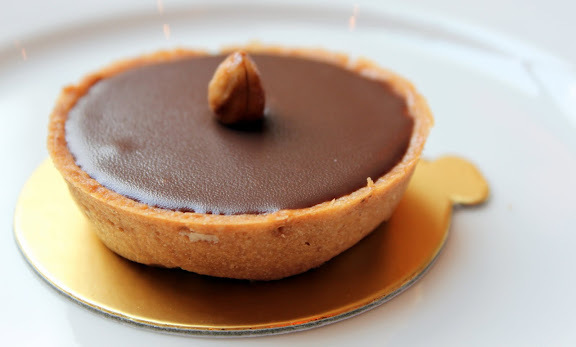 Creamy, thick and full of little mushroom bits, it's hard not to like this one. The more burgers you eat, the more you expect from your burgers and the harder it is too to start looking out for the fine differences, but I'll try. The beef patty from Cafe Epicurious narrowly edges out the ones from The Handburger and Riders Cafe, though for its price I would think that I deserve at least a fried egg on top. I'm quite aware that Epicurious scours the web for online reviews about it, and I'm curious to know how fast it will reach this post. My feedback on the burger is almost the same like some of my peers, who mentioned that the beef patty can get a little "crumbly" at times, the way it tends to fall off chunk by chunk each time I make a decisive pierce into it (the more well-packed patties would include those from Dallas Restaurant and Seah Street Deli). Surprisingly it still managed to retain its juiciness and I enjoyed the hint of herbs and spices too. So yes, burger craving satisfied. I was so full from the soup and burger and I was thinking how in the world could I fit in dessert as well. 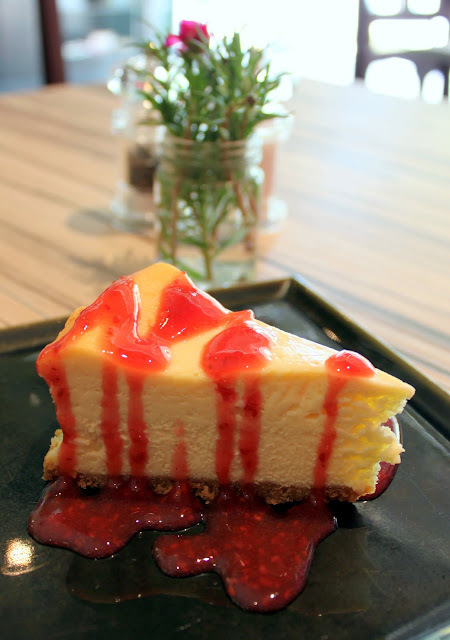 Yet I definitely won't say no to something like white chocolate cheesecake, and oh boy, this was heavenly indeed. A fuller description would be white chocolate, mascarpone and raspberry cheesecake, and I just loved the way how all the different flavours wrapped themselves around something that looks so simple. 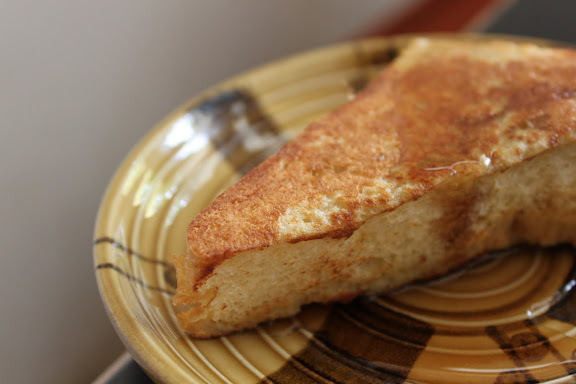 Rich, thick and creamy, this is my kind of cheesecake. 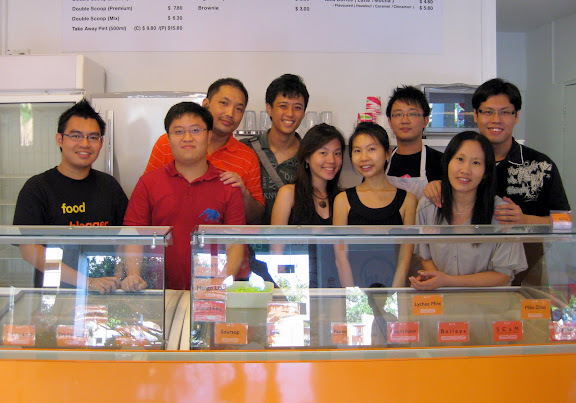 392 The Rail Mall, Upper Bukit Timah Road. If you're wondering how the name "BLIC" came about, it really is a mix of the names of it's two owners, Ben (left) and Larry (right). They realised that they would have to think of something else other than "Ben & Larry's", since that would be quite confusing for the obvious reason, and so joined B and L with Ice-Cream to get BLIC. Right there in the picture above you have three guys who really love their ice-creams, one of them of course only does the eating all the time haha. As the title of this post suggests, my first trip to BLIC was an invited session by Ben himself. 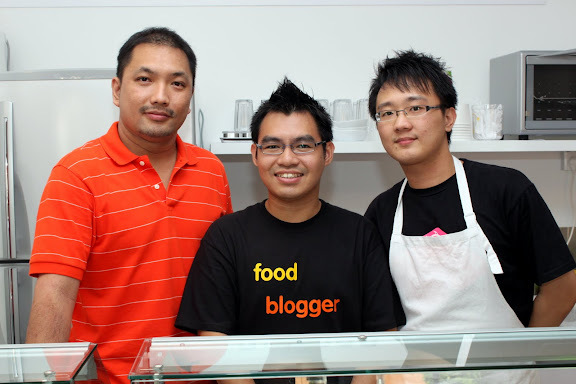 He had suggested that I organise a small bloggers' outing to his cafe so that we could sample the flavours and give him comments on how to improve. I was more than pleased to help him out with that, and brought along an entourage of ten ice-cream lovers after our brunch outing at Botanical Gardens' Halia. Once there at BLIC, we were greeted warmly by Ben and Larry, who then went on to give a detailed introduction on the company and the ice-creams that it offers. We started off with sampling spoons, but people like me would need more than a tiny spoonful surely. Once we started on a bowl, we went for another, and another, and another. 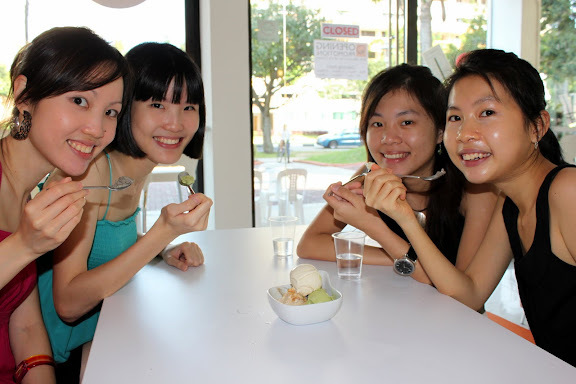 So yes, we're merely posing for a picture and there was so much more ice-creams to come. All on the house by the generous people of BLIC. This is almost like a poster shot, and I like this picture quite a lot. 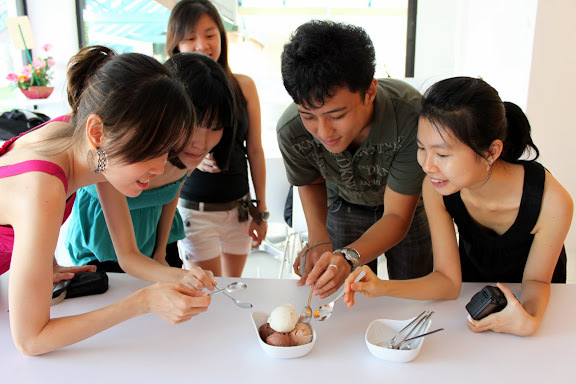 Captures the delight that we all have when it comes to ice-creams. That curiosity, that anticipation, and that first taste... lovely. And here's one more of the ladies. 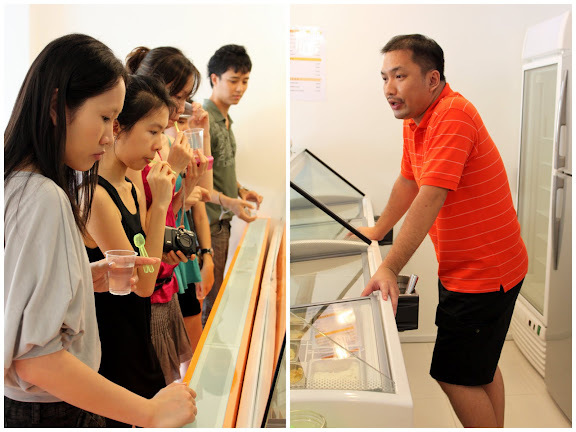 All of us were happily getting into the routine of choosing flavours, taking pictures and then thinking of what flavours to get next. If you like the dark chocolate cakes from Awfully Chocolate, then you would like the Double Choc flavour which was adequately rich and thick. Quite sure it would make for a delicious milkshake that BLIC does as well. My favourite flavour has to be the Ferrero, because I've never tasted one that is so close to the original chocolate, and this especially has bits of nuts and crunch in it so that's an extra plus for me. 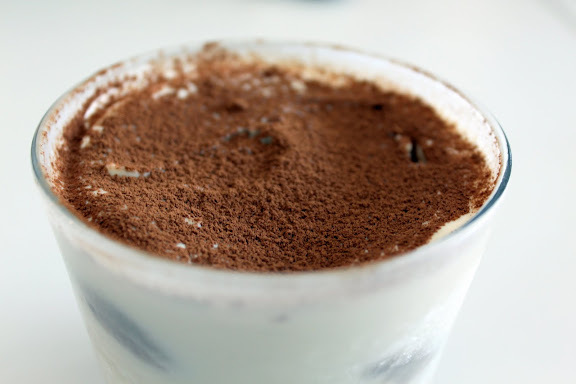 The Dino Milo was smooth and a clear ice-cream version to the typical cold drink. Right on top of the pile lies the Vanilla Bean ice-cream, with numerous specks of vanilla beans. It somehow needs to be richer and fuller in flavour though, and Ben says he would get down to improving on it. True dedication indeed. 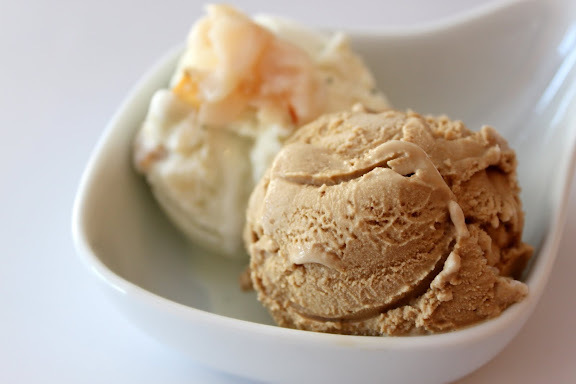 Next up, the Lychee ice-cream was quite delightful as it had lychee bits in the ice-cream as well as on top of it! The Coffee one meanwhile would suit those who like a stronger and more distinct flavour. Be creative, use this as a base, mix it with another flavour and do a milkshake! 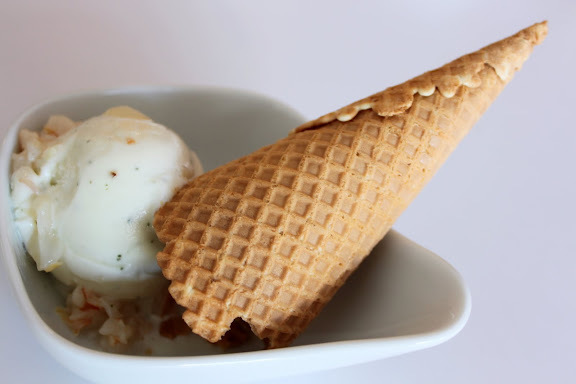 Want more biscuit but don't want it in a cone? Here's what you can do. 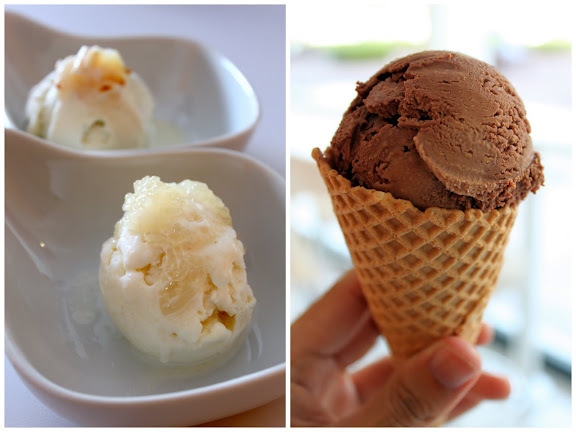 This is the same Lychee ice-cream, and if you look closer, there's vanilla bean specks on it too! 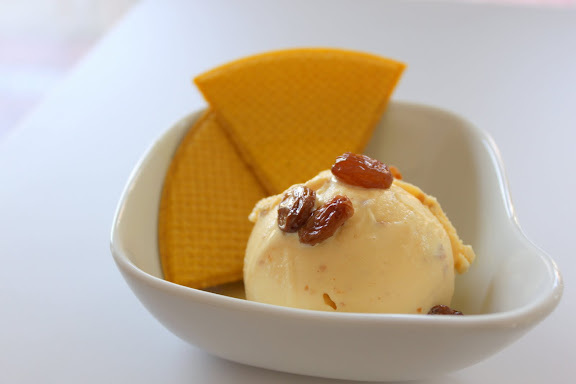 BLIC takes Rum & Raisin to a literal meaning when it adds on larger raisins to your ice-cream. Fair amount of rum (die-hards would demand more of course), but definitely more raisins. 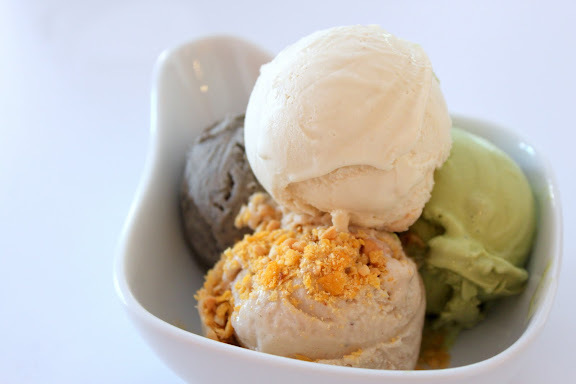 If I had to choose the freshest flavour, it would have to be the Banana Peanut Crunch (the one with golden peanut bits in front), and this would also be another of my personal favourites. A very strong and distinct taste of banana, with the only contender being the Mao Shan Wang Durian flavour. The latter is so potent not just in taste but also in smell, so much so that it has to kept separately (and seal-wrapped) from the rest. The Green Tea ice-cream reminds everyone of matcha surely, but I don't really like it because it isn't very sweet. Black Sesame and Seasalt Malt wraps up this batch, with the malt one tasting so much like Horlicks. 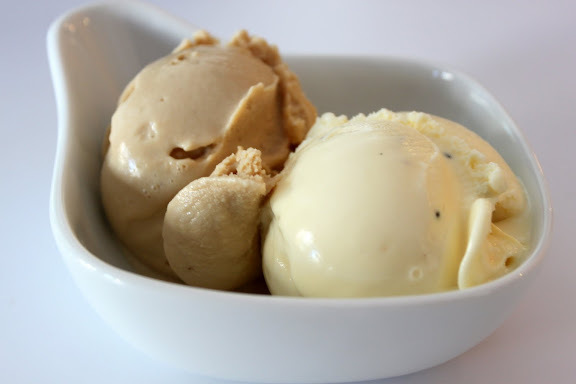 The darker-coloured ice-cream at the back sums up my top three favourites, the Bailey's flavour here is nice and creamy without leaving out that hint of liquer in it. Other than more unique-sounding flavours like "SCaM" (a light mixture of soursop, calamansi and martini) and Mentos Chocolate Ball (mint ice-cream with tiny crunchy chocolate balls in it), there's also a Bird's Nest with Almond (bottom left) flavour that peaked my curiosity quite a bit. This however turned out to be more almond-flavoured that anything else, but if you like almond jellies and stuff, you'd like this one. 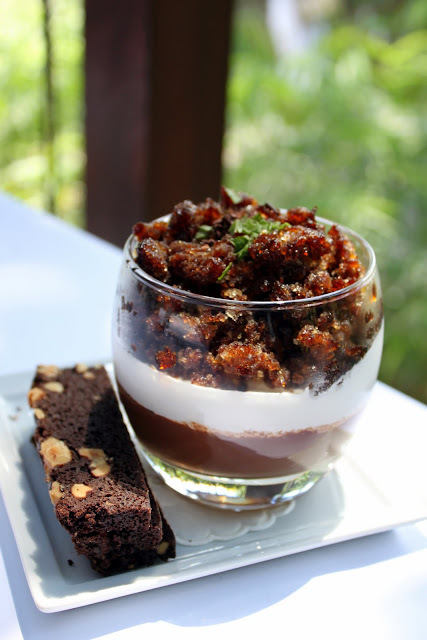 Ben also plans to roll out more items like the Tiramisu, which I think would be quite a hit with the delicious vanilla ice-cream amidst light sponge cake and a soft alcohol-infused biscuit base. He probably has to get a clearer glass that can show the different layers though. Other items that would be available soon includes freshly-baked waffles and brownies, the perfect complements to any ice-cream for sure. Blk 802 Tampines Ave 4 #01-23. Click map (left) to enlarge. 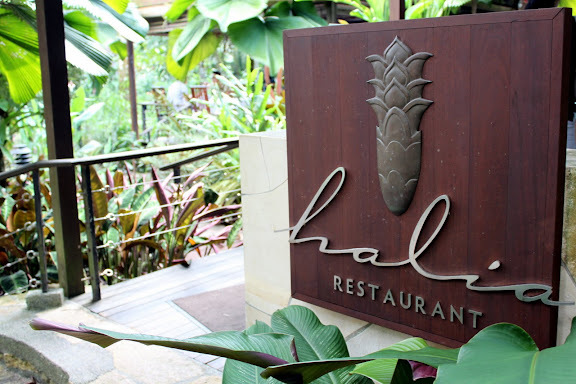 It was just over the weekend when eighteen food bloggers and food enthusiasts alike came together for a hearty brunch at Halia, a pretty restaurant nestled amidst the greenery of the Singapore Botanic Gardens. This is one of the largest bloggers' outing that I've organised yet, but thanks must surely go to each and every one of the participants for being so nice and helpful with the deposits, pre-orders and all. Like always, I'm usually one of the first few to write about the outing, and it's not because I'm racing to do it before everyone else but I'm really just trying to manage it with my backlogs and not end up writing about it six weeks later! 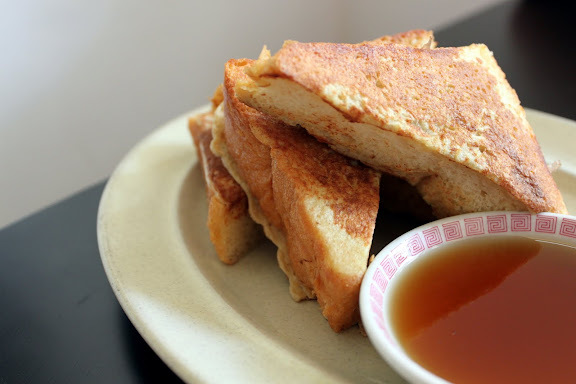 The french toasts did look pretty and did taste promising at the start, but after a while it got quite overwhelming with the mix of strawberry sauce and honeycomb butter. The cinnamon flavour was not as discernible as I hoped it would be, though the strawberries were really sweet and a delight to chew on. There were a few orders around for the Kurobuta pork burger, and quite mixed reviews of it as well. I remember hearing a coo of delight from Leanne and a "mmm" from Daniel at my table, though Phoebe and Zaylene weren't too impressed themselves. 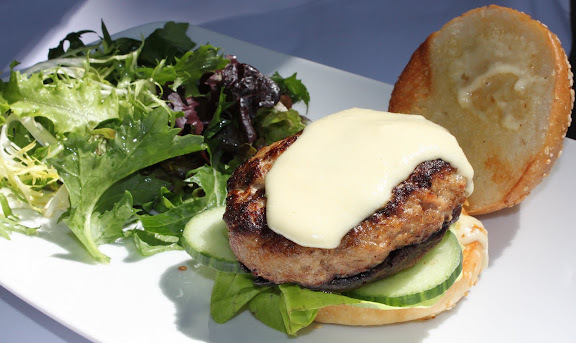 Leanne and Daniel thought the burger patty was well-done with a marinate of herbs and spices. Also worth mention is the apple aioli sauce which everyone enjoyed. Interestingly, the menu also stated that sake was added! 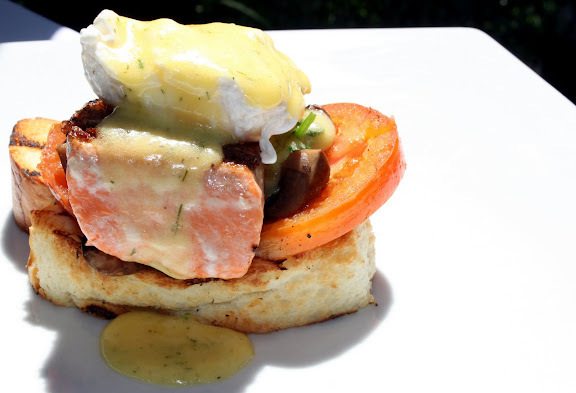 The poached eggs, or more affectionately known as Eggs Ben(edict), came in three variations with a fish, meat or vegetarian option. Probably the favourite amongst the three poached egg dishes, not surprisingly the crispy bacon won praise amongst some of those who ordered this. Both Angeline and Kaelyn chose the vegetarian option, though I know that Angeline, with high standards for her much faved Eggs Ben, didn't like this that much. 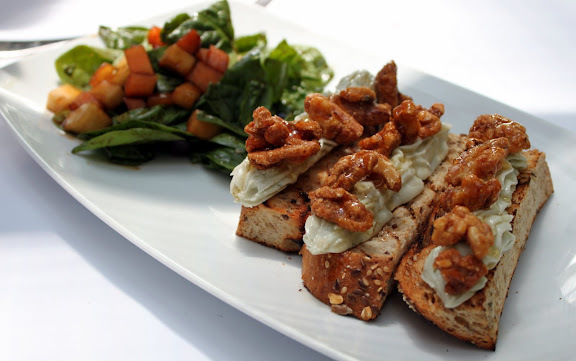 I think the menu would describe this dish better than me: "Gorgonzola mousse, maple-glazed roasted walnuts and wild mountain honey on multi-grain toast fingers, with young spinach & fresh fruit vincotto salad". As Cheryl said, blue cheese is an acquired taste (and so is the smell too! ), but she found it alright. Got a little too overpowering near the end though. 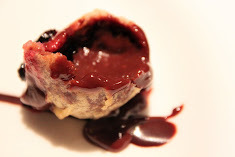 I read about this dessert and I was wanting to try this out, and luckily I had Glenn to "share the sin" with me. 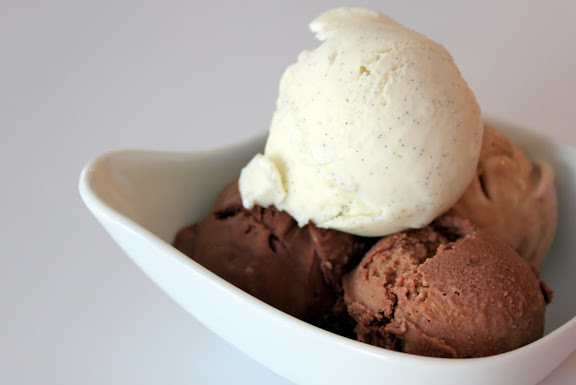 This certainly looked very promising with the cappuccino ice-shavings on top of chocolate and vanilla cream, but pity that it was cream and not ice-cream, which would have been sooooooooo much better! The chocolate biscuits (or biscotti) that were served to "dunk" into the "pit" were delicious though, but more would be nice! Excellent. Much thanks must go to Ms Trina who helped to organise this event with me, and the staff on duty for the day were also very friendly and polite. Ginger Garden, Singapore Botanic Gardens. Calling out all bloggers! 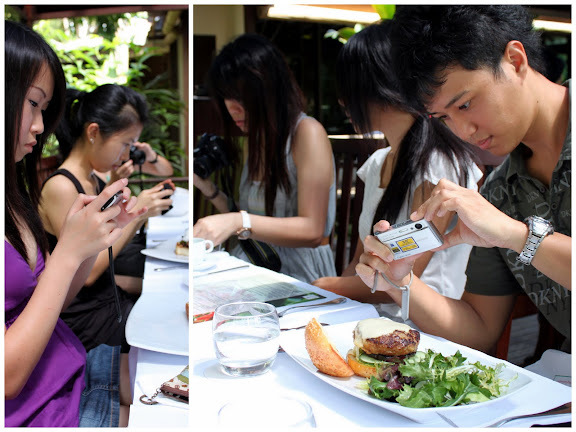 The NUSS Bukit Timah Guild House has organised a blogging contest around its two restaurants, The Dunearn and The Upper Quad, where all you have to do is to blog about your experience at either one of these places and illustrate it with your beautiful pictures! 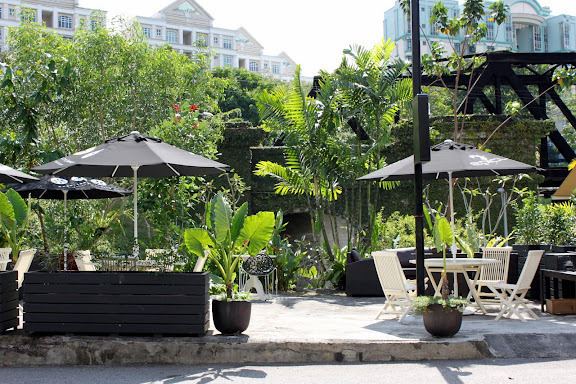 A great reason to try out some place new, especially with the serene setting of a quaint, colonial bungalow surrounded by the lush foliage of the Singapore Botanic Gardens. This contest is open to the public and will close on 28 February 2010. If there's anyone out there who's interested to visit The Dunearn and wants some company, I would be glad to come along! I'm pretty eager to have a look around at this award-winning (restored) colonial bungalow, and a pleasant meal far away from the bustle of the city does sound really good to me. It's not often that I actually get offers to attend food samplings or tasting sessions, but a lunch invitation right from home in NUS? Now that's something special to me. 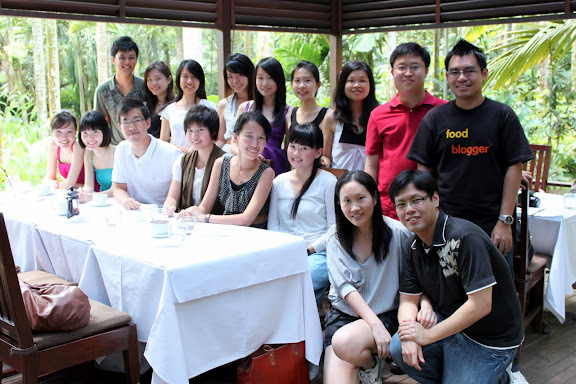 Much thanks must go to the lovely people from the National University of Singapore Society (NUSS), Ikram and Gayle, for having me over for lunch at the members-only Cafe on the Ridge at the spanking new NUSS Kent Ridge Guild House. 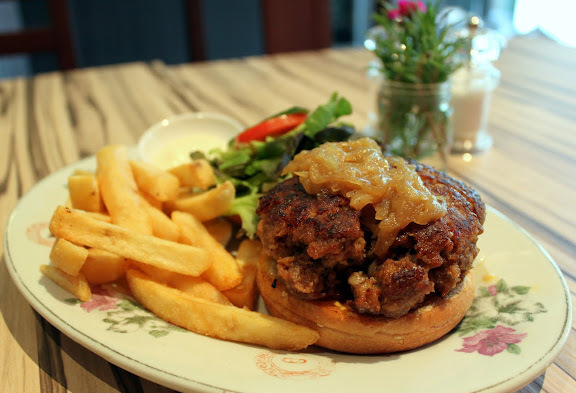 While most of the NUSS Guild Houses are strictly for NUSS members and NUS Faculty Staff, the Bukit Timah Guild House along Cluny Road meanwhile is open to the public, and I also hear that its restaurant The Dunearn is helmed by someone who was previously from Les Amis. Lush greenery surrounding a newly restored colonial bungalow (winner of the Urban Redevelopment Authority Architectural Heritage Awards too! ), this place really sounds like an epicurean Eden and I'm definitely making a visit here next month. 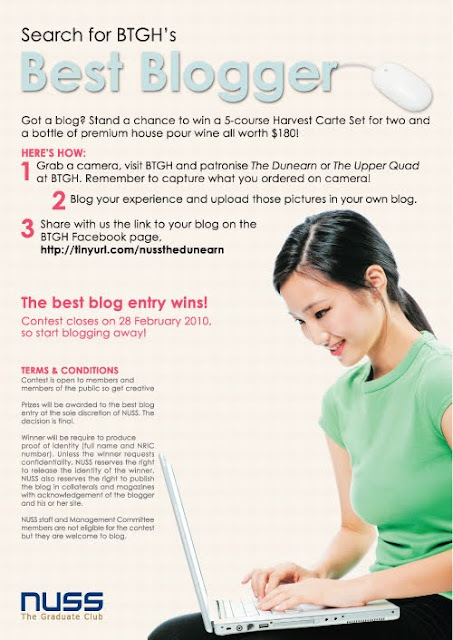 And if you're interested, The Dunearn is also holding a blogging contest! Details on that would be posted up very soon, so stay tuned! 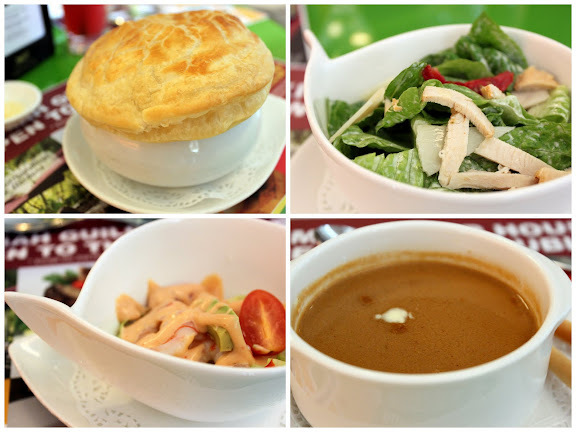 Cafe on the Ridge boasts value-for-money three-course lunch set meals at $19.90++, where you get a choice of a salad, a soup and a main course. While Ikram had the Onion Soup, I opted for the Lobster Bisque instead, and boy was it thick and flavourful. Of course, it was more soup than anything else since there wasn't much lobster meat in it. The Prawn Cocktail Salad and the Grilled Chicken Salad meanwhile were quite alright, admittedly not the most appealing for a seasoned meat-eater like me. It certainly looks pretty, which explains for the name that I came up with (because I didn't take down the actual name haha!). 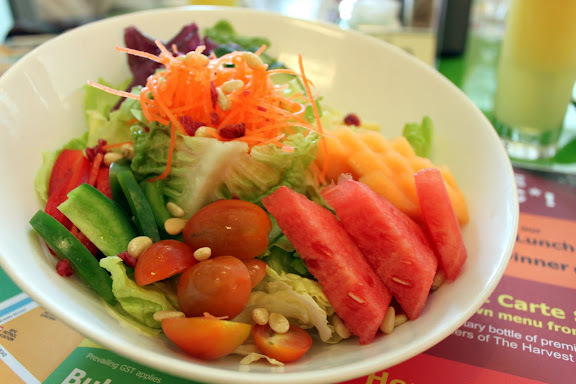 Best for those on detox after a weekend of gastronomic indulgence. 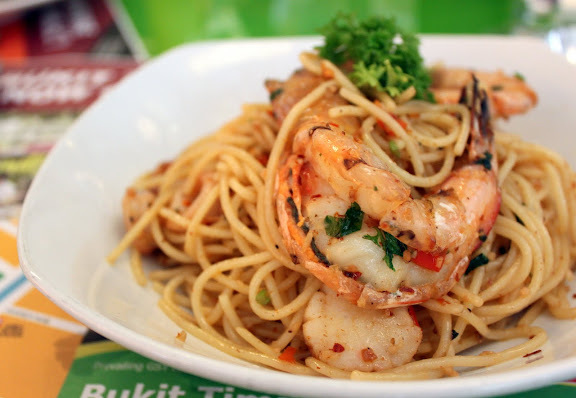 Ikram's personal recommendation was spot-on, and this is really one of the much better renditions of the seafood algio olio pasta that I've ever tried. I'm not kidding, and it's not because I'm obliged to give a glowing review just because it was an invited session. Put tiger prawns, scallops and squids in a slightly spicy, well-cooked and well-oiled pasta and hey, this is a winner. My best friend, whom I brought along for lunch, got herself the in-house favourite. 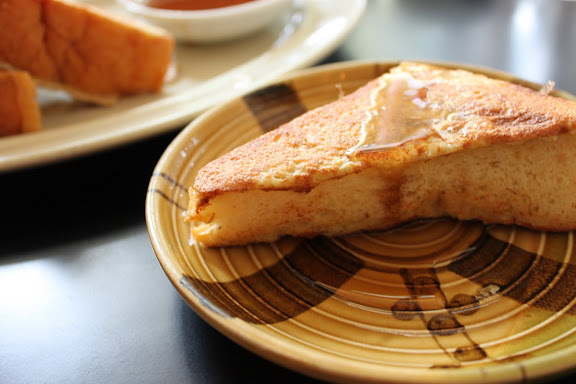 I've read a lot about this dish on Keropokman's blog, and I can definitely see why it is so popular. There's fried rice with a sunny-side up yes, as well as achar, prawn crackers, ayam masak merah, beef rendang and sambal prawns. That's a lot of things for lunch right! 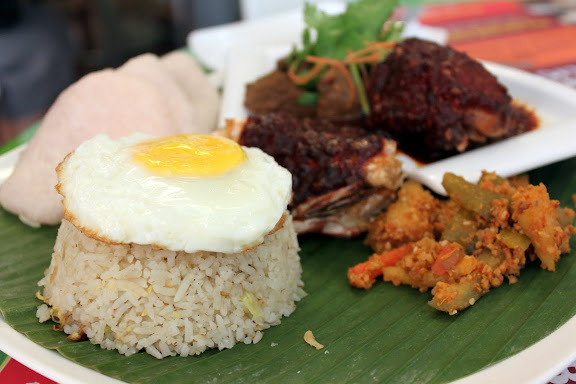 The best friend likes it a lot, so one more fan for the Nasi Goreng Istimewa! Ikram had the tenderloin steak, but I have to admit that it didn't look as filling as my pasta or the best friend's fried rice. Maybe we should try the steak at The Dunearn, I saw it on the placemat and it looks very enticing indeed! Once again, look out for details on the blogging contest soon! 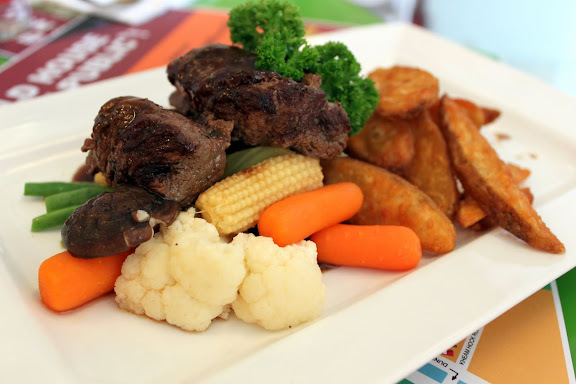 $19.90++ for the three-course set lunch. NUSS Kent Ridge Guild House. 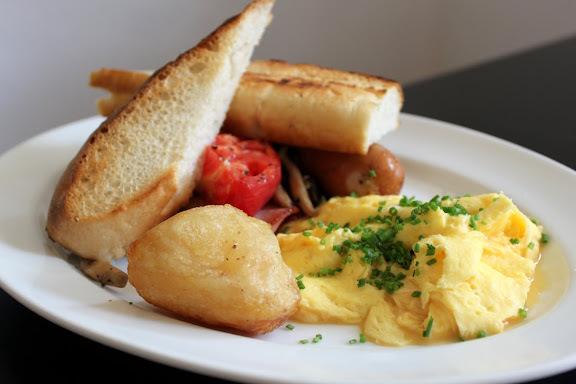 As I've mentioned before, brunch is starting to be a little habit of indulgence for me, a weekend routine even, but it also explains why I would now look forward to each weekend with such great eagerness. 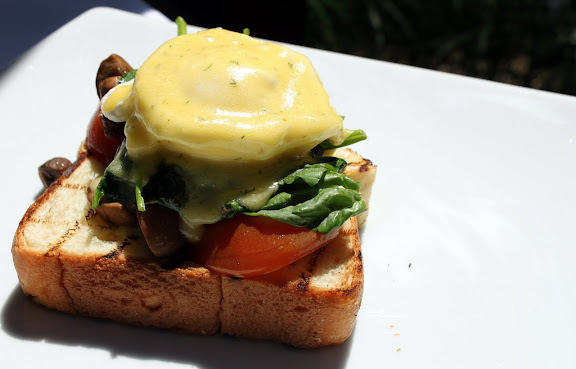 Spruce is definitely one of the "must-go" places for brunch, amongst the other much raved-about places like PS Cafe at Harding, Wild Honey, Epicurious and Riders Cafe. Some food bloggers have conquered them all of course, but I'm still slowly finding my way through this simple, lovely word called brunch. Something worth waking up to with a big smile on your face yes? I'm feeling hungry all over again just looking at this picture. This brunch at Spruce was with fellow blogger Glenn, whose invite for such a morning delight was something I couldn't possibly miss. Read on to know why. Such a pretty sight. This is the Harris' "Spruced-Up Breakfast", my own creation from a mixture of their side orders. I didn't get Spruce's "Big Brekkie" because it has bacon in it, and moreover I was very keen to try out the French Toasts. All I can say is: fantastic decision. 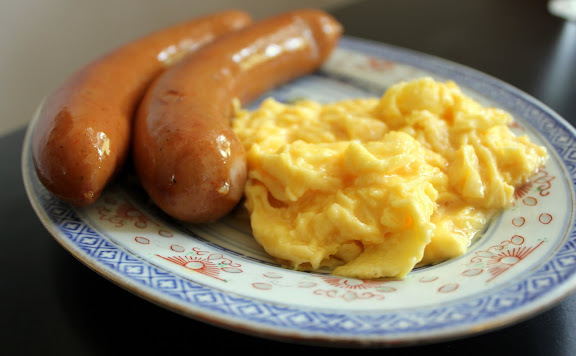 Two juicy, tasty sausages to behold, with delicious scrambled eggs as company. Yum, yum, and more yum. 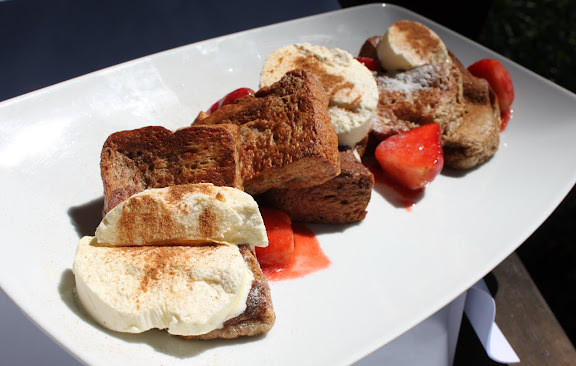 When the French Toasts arrived, me and Glenn stared at it in disbelief. I was expecting just two halves of a thick toast, but I got two whole thick toasts instead. For comparison, the toasts pretty much filled up two-thirds of the plate that was the same size as Glenn's "Big Brekkie"! And with every French Toast, don't forget that divinely sweet maple syrup. I thought this was much better than the ones from Casa Verde, which were smaller, more pricey ($8.50 to Spruce's $5) and not as satisfying somehow. I'm in love with brunch. 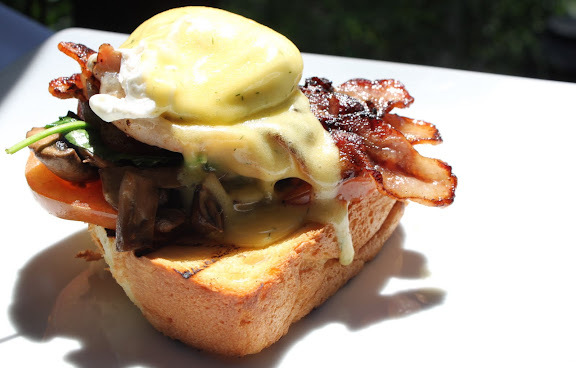 Of course, if you would prefer something of more variety, The Spruce Big Brekkie would suit you well with the addition of bacon, roasted mushrooms and grilled vegetables. 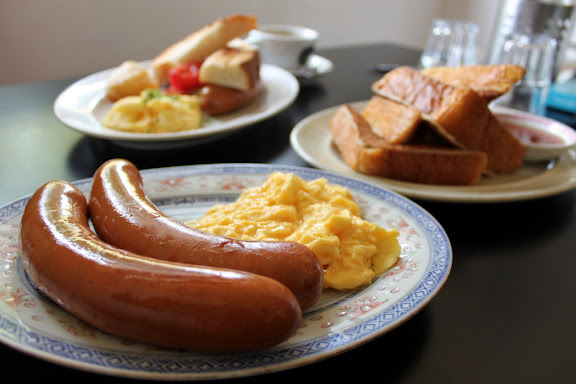 My only problem with this is that you only get one of that awesome beef sausage, and trust me when I say one is definitely not enough to get your morning going. It's not because it's small, but it's because I just like it very much, even if it isn't as heavily-flavoured with black peppers or cheese as some other sausages are. Glenn felt his eggs were a tad overdone though, but I thought mine were done well. I'm good to go for brunch again at Spruce. 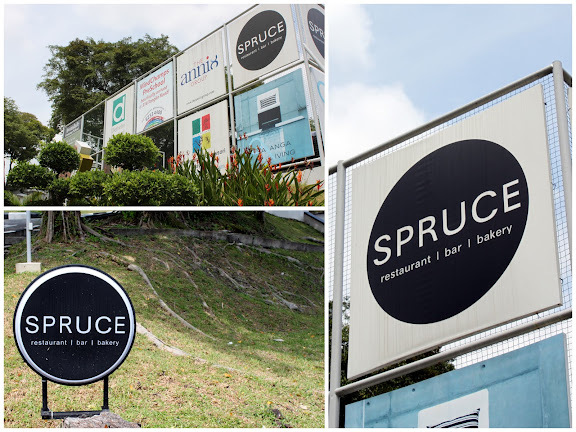 I know Angeline is craving for her Eggs Benny, I hear Spruce does an awesome job of it, and I'm looking forward to try their famous burgers too! Good, but it can be a little difficult to get their attention sometimes on a crowded weekend morning. Reservations are a must! 320 Tanglin Road, Phoenix Park. Two bus-stops away from Redhill MRT Station with SBS Bus 132.